Indices to births, marriages, and deaths in Cugnoli for 1858. Camillo Cuzzi si è unito in matrimonio con Pasquarosa Mucci di Catignano, n.2 – Nocciano 12 Marzo 1870. Teramo 20 Aprile 1872. Carmine di Profio si unì in matrimonio con Annantonia di Virgilio di Nocciano che domiciliava in Alanno il giorno 21 Ottobre 1869, n.21 – Nocciano 24 Ottobre 1869. Teramo 23 Aprile 1872. Vincenzo Antonio de Marinis nel 18 Marzo 1875 si unì in matrimonio con Maria Lauretana d’Ovidio, n.2. Teramo 13 Maggio 1876. Raffaele Cuzzi si è unito in matrimonio con Santa Napoleone di Nocciano, n.2 – Nocciano 14 Marzo 1874. Teramo 18 Giugno 1874. *Marriage occurred on 28 Maggio 1836 in Pianella. *Marriage occurred on 5 Giugno 1836 in Alanno. Indices to births, marriages, and deaths in Cugnoli for 1859. You may have noticed that, aside from the full transcriptions of the towns of Nocciano and Civitaquana, where my mother’s ancestors were focused hundreds of years ago, I’ve begun to index the records for surrounding towns. I have already posted Catignano (1850-1860) and Pianella (1854-1865), and now have the year 1860 for Cugnoli available online. Just go to Atti di Stato Civile above to see indexed records available. 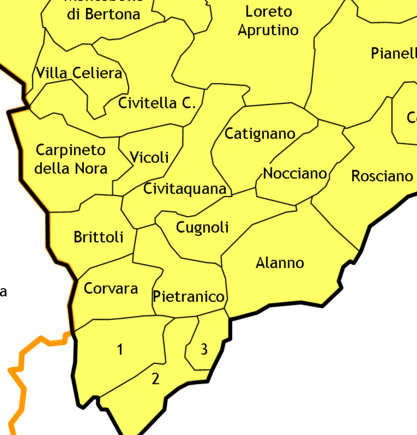 Cugnoli borders both Nocciano and Civitaquana (more so Civitaquana). It has a population of about 1,700. Some of the most popular surnames from Cugnoli are: Silvestri, di Domizio, Chiulli, and Manzoli. One cognome (“surname”) of particular interest to me is Chiulli. I’ve seen this name most in Civitaquana, where there seem to be a few families living at least since the mid-1700s. Since it’s such a common name in Cugnoli, my initial guess is that they all originated in Cugnoli, and one moved to Civitaquana and started a family there. It is these connections that I hope to make as I continue transcribing and indexing all these records. Chiulli also appears, though much less frequently, in Nocciano in the late 1800s, the earliest being Berardino Chiulli, a frequent witness (“testimone”) on birth and death records in Nocciano. Indices to births, marriages, and deaths in Catignano for 1851. Indices to births, marriages, and deaths in Catignano for 1852. Indices to births, marriages, and deaths in Catignano for 1853.